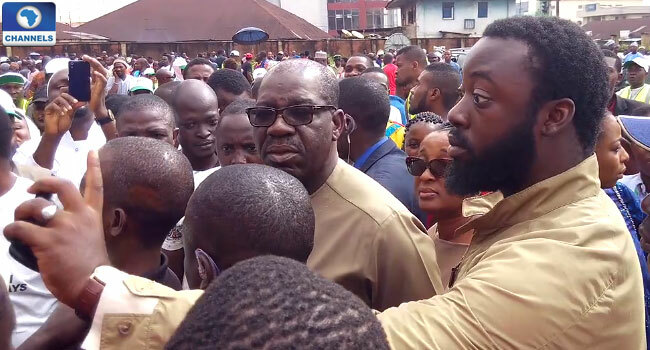 As Mr Adams Oshiomhole rounds up his tenure as Governor of Edo State, residents trooped out in their numbers to decide who takes over the baton of leadership in the state for another four years. The governorship election took place in 18 local government areas of Edo State in South-south Nigeria. Nineteen candidates contested in the election. 4:08pm: INEC declares APC candidate, Mr Godwin Obaseki, as the winner of the Edo State governorship election. 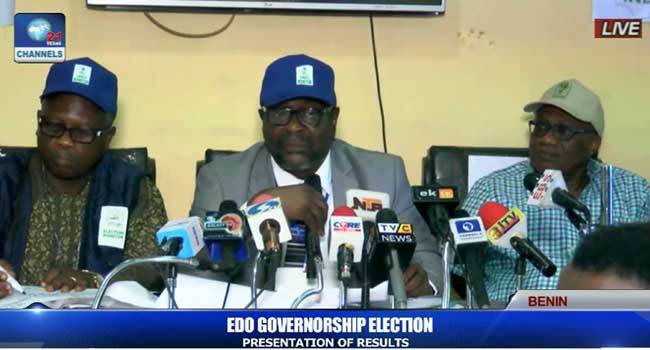 4:05pm: The Returning Officer for the Edo State governorship elections, Professor Kayode Soremekun, announced the final results as follows: AA – 155; ACD – 1,350; ACPN – 3,184; APC – 319,483; APGA – 876; CPP – 226; ID – 99; KOWA – 75; LP – 182; NPPP – 125; NCP – 294; NNPP – 118; PDC – 1,289; PDP – 253,173; PPA – 855; PPN – 112; SDP – 72; UPP – 431; YDP – 200. 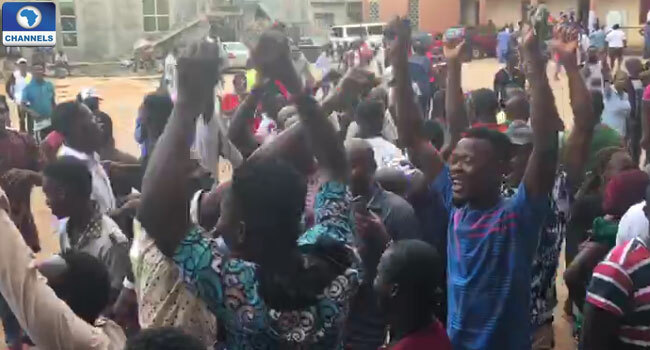 1:29pm: Akoko LGA: APC – 24, 545, PDP 13, 027, Total Valid Votes – 37, 946, Rejected Votes – 1,684, Total Votes Cast – 39, 630. 1:15pm: Ikpoba-Okha: ACP- 175, ACPN – 401 APC – 33, 469, APGA – 148, CPP – 52, ID – 9, KOWA – 15, LP – 54, NPPP – 17, NCP – 63, NNPP – 19, PDC – 181, PDP – 26,096, PPA – 102, PPN – 19, SDP – 12, UPP – 169, YDP – 16. Total Valid Votes – 61, 055, Rejected Votes – 3, 826, Total Votes Cast – 64, 881. 12:39pm: Etsako East: AA – 2, ACP – 30, ACPN – 80, APC – 18,078, APGA – 30, CPP – 7, ID – 4, KOWA – 2, LP – 2, NPPP – 2, NCP – 7, NNPP – 3, PDP – 12, 552, PPA – 23, PPN – 0, SDP – 1, UPP – 5, YDP – 4. Total Valid Votes – 30,858, Rejected Votes – 1, 056, Total Votes Cast – 31,914. 12:24pm: Esan North Central: AA – 2, ACD – 36, ACPN – 99, APC – 9,781, APGA – 28, CPP – 7, ID – 5, KOWA – 2, LP – 3, NPPP – 1, NCP -2, NNPP – 2, PDC – 37, PDP – 10, 180, PPA – 35, PPN – 2, SDP – 1, UPP – 1, YDP 7. Total Valid Votes – 20,211, Rejected Votes – 1153, Total Vores Cast – 21,364. 12:24pm: Etsako Cenral: AA – 1, ACD – 24, ACPN – 60, APC – 10,373, APGA – 15, CPP – 3, ID – 1, KOWA – 1, LP – 0, NPPP – 2, NCP – 2, NNPP – 2, PDC – 27, PDP – 8,827, PPA 14, PPN – 1, SDP – 2, UPP – 1, YDP – 2. Total Valid Votes -19538, Rejected Votes 549, Total Votes Cast 19,907. 12:29pm: Owan East LGA: AA – 7, ACD – 73, ACPN – , APC 21,233, APGA – 35, CPP – 6, ID – 4, KOWA – 1, LP – 6, NPPP – 7, NCP – 12, NNPP – 7, PDC – 52, PDP – 12,889, PPA – 35, PPN – 2, SDP 5, UPP – 0, YDP 12. Total Valid Votes 34,599, Rejected Votes 1,523, Total Votes cast – 36,122. 12:15pm: Ovia North LGA: APC – 17, 561, PDP – 13, 141. Total Valid Votes – 31, 415, Rejected Votes – 1,545, Total Votes Cast – 32,960. 12:10pm: INEC resumes announcement of results. 10:59am: INEC officials call for a break till 12 noon before continuation of result announcement. 10:55am: Esan West LGA: AA – 4, ACD – 65, ACPN – 172, APC – 13,114, APGA – 36, CPP – 13, ID – 12, KOWA – 1, LP – 5, NPPP – 27, NCP – 13, NNPP – 6, PDC – 79, PDP – 16,311, PPA – 49, PPN – 2, SDP – 2, UPP – 33, YDP – 19. Total Valid Votes – 29,963, Rejected Votes – 1,563, Total Votes Cast – 31, 526. 10:43am: Orhionmwon LGA: AA – 7, ACD – 85, ACPN – 149, APC – 15,262, APGA – 37, CPP – 13, ID – 4, KOWA – 10, LP – 8, NPPP – 5, NCP – 14, NNPP – 9, PDC – 58, PDP – 16, 446, PPA – 68, PPN – 5, SDP – 8, UPP – 21, YDP – 7. Total Valid Votes – 32,213, Rejected Votes – 1,788, Total Votes Cast – 34,001. 10:30am: There is a back and forth over results of Oredo LGA by officials of political parties and officials of the Independent National Electoral Commission (INEC). 10:12am: Oredo LGA: AA – 16, ACD – 156, ACPN – 420, APC – 37, 612, APGA – 162, CPP – 23, ID – 6, KOWA – 8, LP – 45 , NPPP- 9, NCP – 42, NNPP – 9, PDC – 226, PDP – 30,492, PPA – 101, PPN – 15, SDP – 5, UPP – 33, YDP 21. Total Valid Votes – 69,401, Rejected Votes – 4,311, Total Votes Cast – 73,712. 10:07am: Esan South East LGA: AA – 1, ACD – 27, ACPN – 84, APC – 9,554, APGA – 17, CPP – 9, ID – 4, KOWA – 3, LP – 5, NPPP – 1, NCP – 8, NNPP – 3, PDC – 38, PDP – 11, 466, PPA – 18, PPN – 4, SDP – 3, UPP – 1, YDP – 4,. Total valid Votes – 21,250, Rejected Votes – 806, Total Votes Cast – 22,056. 9:53am: Uhunwomnde: AA- 5, ACD – 69, ACPN – 105, APC – 10,911, APGA – 2020, CPP , ID- 6, KOWA -3 LP – 4, NPPP – 8, NCP – 20, NNPP – 6, PDC – 36, PDP – 8667, PPA – 30, PPN – 5, SDP – 3, UPP – 47, YPP – 14. Total Valid Votes – 19971, Rejected Votes – 1,759, Total Votes Cast – 21, 730. 9:37am: Igueben LGA: AA – 1, ACD – 31, ACPN – 45, APC – 7,802, APGA – 6, CPP – 0, ID – 0, KOWA – 0, LP – 0, NPPP – 0, NCP – 0, NNPP – 0, PDC – 26, PDP – 7,560, PPA – 24, PPN -5, SDP – 0, UPP – 3, YDP – 3. Total Valid Votes -15506, Rejected Voted – 580, Total Votes Cast – 16086. 9:30am: Esan North East LGA: AA – 06, ACD – 5, ACPN – 109, APC – 9, 130, APGA – 38, CPP – 9, ID – 03, KOWA – 0, LP – 2, NPPP – 4, NCP – 16, NNPP – 5, PDC – 85, PDP – 16, 220, PPA – 46, PPM – 2, SDP – 3, UPP – 7, YDP – 12. Total Valid Votes – 25,747, Rejected Votes – 1,197, Total Votes Cast – 26,944. 9:20am: Egor LGA: AA – 18, ACD – 164, ACPN – 351, APC – 26,177, APGA 112, NPPP – 10, NCP – 23, NNPP – 15, PDC- 122, PDP – 19514, PPA- 93, PPM – 8, SDP – 5, UPP – 57, YDP – 14. Total Votes Cast – 46,728, Rejected Votes – 2,811. 9:15am: Owan West LGA : AA – 0, APC 12, 862, APGA – 21, CPP – 3, ID – 04, KOWA- 1, LP – 2, NPPP – 5, NCP – 6, NNPP – 5, PDC – 40, PDP – 10, 132, PPA – 37, PPM – 9, SDP – 4, UPP – 1, YDP – 10. Total Valid Votes 23, 290, Rejected Votes – 1002, Total Votes Cast – 24, 292. 9:00am: INEC begins announcement of results. 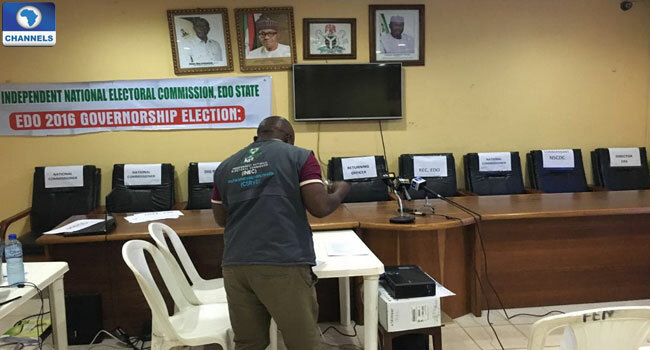 7:40am: INEC Commissioner on Voter Education, Mr Solomon Soyebi says the Commission is awaiting results from eight Local Government Areas before collation commences “in an hour”. He, however, didn’t mention which local government areas these are. 1:59am: Delay of results announcement triggers agitations at INEC Headquarters. Young men and women throng the place. Police won’t allow them access into the premises. 12:30am: Thursday, September 29, 2016: More vehicles moving into INEC Headquarters blaring siren. It appears they have some results, Seun Okinbaloye said. 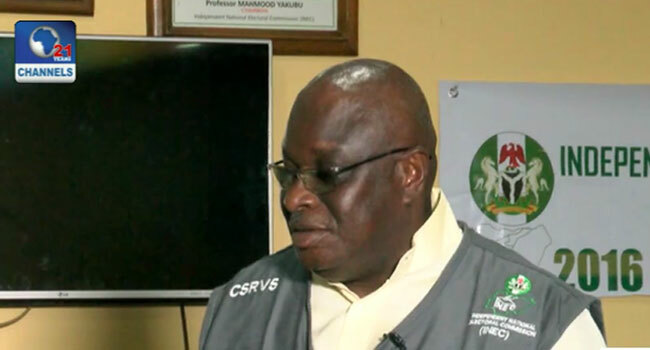 10:00pm: INEC National Commissioner, Solomon Soyebi, says no result is at the INEC Headquarters yet. Reporters still waiting. “From tracking we know that some results are ready,” he said, but could not give the number of local council where results are ready. “So far so good. This is one of the most beautiful elections we have conducted in recent times. It was very peaceful. There was large voters’ turnout. The good people of Edo State conducted themselves very properly,” the INEC official stated. He confirmed that there were pockets of ballot snatching, but said it was minimal compared to expectations. 9:10pm: INEC officials at the Headquarters monitoring activities of field officials compiling results at different local government areas. 8:00pm: Reporters waiting for results to begin to come in at the INEC Headquarters. 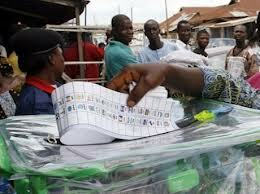 Channels Television’s correspondent Seun Okinbaloye said no local government has returned items to the INEC office. 6:00pm: The Peoples Democratic Party claims Oshiomhole, INEC plan to rig the governorship election at the electoral body’s collation centres. The opposition party said that the delay by the Independent National Electoral Commission (INEC) to begin ward results announcement was a sign of the plan. 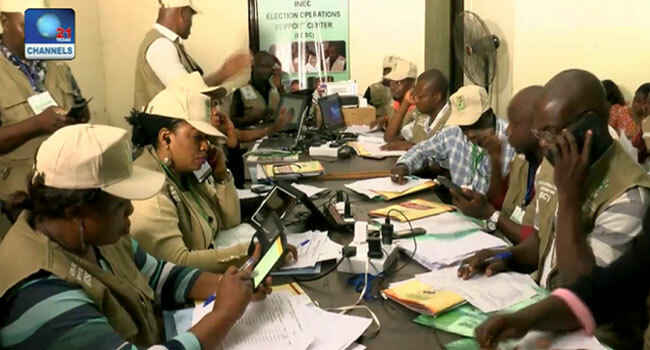 5:45pm: INEC tells Nigerians to disregard results on Social Media. Only INEC can do so, the electoral body warned. INEC issued the warning on its Twitter handle. 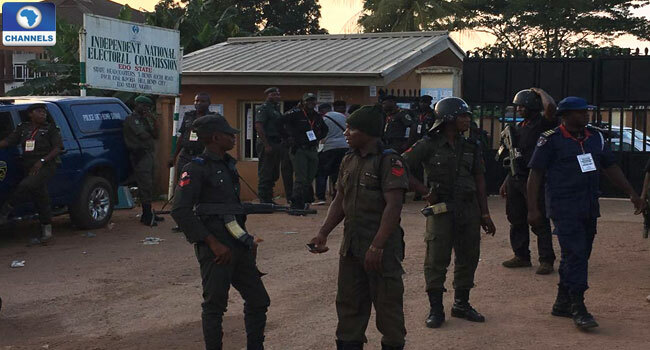 5:05pm: Heavy security presence at INEC Headquarters, as the electoral body awaits the arrival of materials from local government wards. 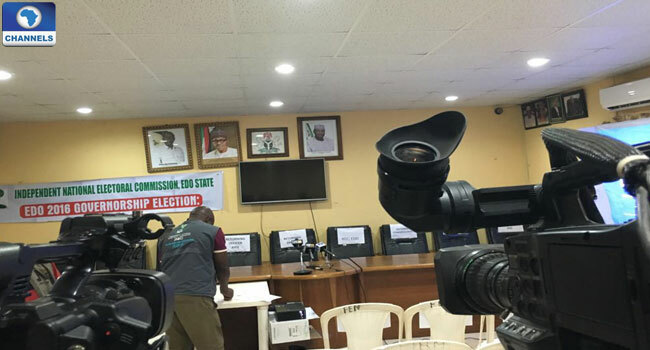 4:50pm: At INEC Headquarters, stage is set for results announcement, but national officials are awaiting the results from the local governments. 4:45pm: Results compilation ongoing at the ward and then at the local government levels. 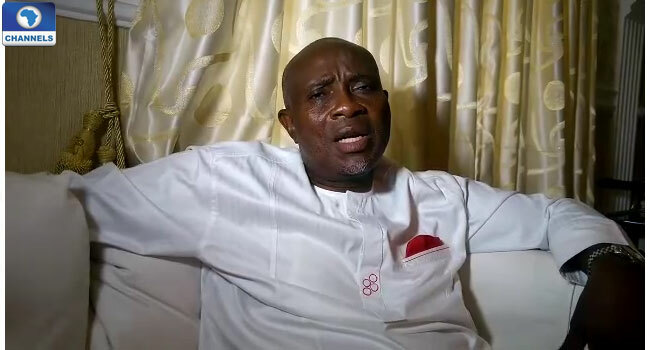 4:05pm: The candidate of the All Progressive Grand Alliance (APGA), Osaro Onaiwu, calls for total cancellation of poll. He alleges financial inducement and intimidation of Party loyalists. 2:46pm: Counting of votes begins in some polling units. 11:05am: Voting is ongoing at the polling centre in Agbado Primary School in Benin City. INEC National Commissioner, Mrs Amina Zakari, says process has gone based on expectation. She says that security agents are doing their work and the people of Edo State are doing what is expected of them. 10:40am: The poll got off to a smooth start in some polling centres at Esan West Local Government Area with good turnouts of electorates. While voting takes place in an orderly manner, polling officers at the central primary school in Esan West say the entire process has been going on smoothly with little or no incidents with the card readers. 09:40am: At another polling point, election is going on peacefully. The turnout of voters is massive with the presence of heavily-armed security operatives at the premises of the election venue. 08:45am: Ballot boxes are getting filled up. People with disabilities are also at the polling units to vote the candidate of their choice. The election has been peaceful so far and voters hope that the process continues that way. 08:19am: Channels Television reports that voting has commenced in the state. 07:45am: Channels Television correspondent reports from Benin City, the Edo State capital. Officials of the Independent National Electoral Commission (INEC), security operatives and voters arrived the polling centre as early as 07:00am.